Walking in the Rain - Be your true self! For anyone seeking fresh air and ideas. Walking is medicine for the mind. It helps us slow down and think things through. It also helps us perk up and generate new ideas. There are few activities as readily available and revitalising as a brisk walk, or as soothing and stimulating as a long walk. Wonderful things can happen when we set out on two feet. 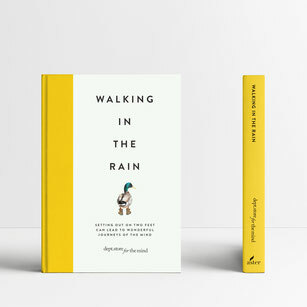 In Walking in the Rain, one of the first two titles in the new Department Store for the Mind series, you will find stories from artists, designers, writers, psychologists and speakers who are inspired by the effect of pacing outdoors. You will hear of walks in the city, hikes through woods at dawn and epic adventures involving long journeys on foot. No matter the scale of the tale, the writer offers lessons they learned of a simple, human nature that we can all understand. 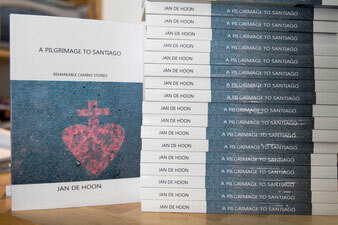 Gert-Jan de Hoon has written two chapters about walking the Camino. One story about Camino Walking Blind, a group of visually impaired walkers and their buddies walking 200 kms to Santiago de Compostela. Another story about family dynamics on the Camino, a mother and son walking from Porto to Santiago. In October 2007 I returned to Spain, back to the pilgrims’ way I had walked for the first time in 2005. Again I walked from St. Jean-Pied-de-Port in the Pyrenees to Santiago de Compostela, listening to the stories of pilgrims on the way. 4 weeks later I reached Santiago having collected 35 inspiring stories. When I was writing these stories back in Holland, why people came to Spain to walk the camino, with every story I asked myself: “Now what is your camino, what is your story?” I had been very focused on others, and had no answer myself. So I decided to return in January 2008, to walk again 800 kilometers. This time I would be alone most of the time, it would be cold with bad weather and not a lot of daylight hours. I walked a lonely pilgrimage and I did meet myself several times on the way. The pilgrim in me walked on and reached Santiago on a rainy day early February. The book A pilgrimage to Santiago contains the story of my winter camino and 33 short life changing stories of pilgrims from all over the world. I self published the book and you can order it here. The price is €15,95 (excluding postage). Send me an email with your details if you wish to order the book. Contact us for a talk about the Camino. It is now almost a year ago that we met on the Camino Primitivo de Santiago. I think back at that meeting regularly. In the first minutes of that chance encounter (is there such a thing, really? ), I could tell that you were a true seeker. Someone interested in life, in your fellow man, in happiness, in meaning, simplicity, and truth. It also did not take long for you to reveal how much wisdom you had gained over the years from that keen interest. I appreciate the generosity with which you shared that wisdom and I particularly recall with fondness our discussion about balance. It is a guiding principle in my life and the thoughts you shared on this resonate to date.